Masters of Horror is the brain child of Mick Garris, the idea to assemble the best horror film directors and let each loose for an hour to create a new millennium of terror for the small screen. The names in question are: John Carpenter (Halloween, The Thing, etc. ), John Landis (An American Werewolf in London), Dario Argento (Demons), Tobe Hooper (The Texas Chainsaw Massacre), Don Coscarelli (the Child's Play films, Bubba Ho-Tep), as well as Stuart Gordon and Mick Garris himself. This first twin-release showcases Carpenter and Gordon. What can I say except that John Carpenter is a genius? A bias opinion perhaps, as I'm a long- time fan. But in this case it's not all his doing. Carpenter had pretty much retired after Ghosts of Mars, hinting that he might return if the right script came along. So here he is, in his own words an old man, returning to the fray after being impressed with the dialogue-driven script by Drew McWeeny and Scott Swan. A very creditable job he does too, using a passive direction which allows the suspense of the story to seep into you, rather than slapping the audience round the face with the concept. It's good to see Carpenter has lost none of his brutal honesty; both feet are firmly on the ground. He ridicules the idea that anyone, least of all himself, is a "Master of Horror", whilst everyone else sings his praises, and we learn that what scares most people actually makes Carpenter laugh. So we see him on set (on the extras) silently convulsing with laughter before spontaneously applauding a gristly scene. A true character. As for Cigarette Burns itself, it succeeds in allowing the viewer to build the suspense by merely hinting at the film's power and showing fleetingly quick images from the film (which work in a similar manor to Sadako's video in the Japanese film The Ring). It doesn't weaken the plot that we never discover what Le Fin Absolue du Monde is actually about - apart from it being an art film. There's a fine balance at play with the images, and it's difficult to know what to make of the angel which the collector keeps chained up, its wings savagely removed as a memento. It's not laughable, nor is it frightening, merely surreal. For me personally there is only one step too far (silly, not scary) when the collector feeds his own entrails into the projector. Cigarette Burns has certain similarities to Carpenter's own In the Mouth of Madness, particularly the cinema version of a best-selling horror book which turns the audience into mindless psychotics. I would have preferred that Carpenter script his own piece, as he has for the majority of his films, but any sort of Carpenter is a bonus these days and this is a good addition to his arsenal. There's a host of special features, including: a commentary by director John Carpenter (although it isn't mentioned, I'm certain I spotted a cameo from the man himself; as Sweetman enters his cinema he is reflected in the glass door walking past); a separate commentary with the writers Drew McWeeny and Scott Swan; Behind the scenes Making of... documentary; Working with a Master - John Carpenter (on set with the man, and comments from others with whom he has worked); an interview with Carpenter; an interview with Norman (Sweetman) Reedus; Cigarette Burns - From Script to Screen; John Carpenter biography; still gallery; visual effects; out-takes; trailers for the others in the Masters of Horror collection; DVD ROM screenplay and screen saver. Stuart Gordon has made a string of horror movies, but arguably none of them bar one has resulted in any mainstream impact. His film version of Re-Animator, based on H.P. Lovecraft's story Herbert West: Re-Animator, struck just the right balance between Frankenstein-like horror and black humour. Although Dreams in the Witch House is scripted by Dennis Paoli and Gordon himself, it is again based on work by Lovecraft. Let's be absolutely honest and say in this instance Lovecraft is the only "Master of Horror" here. The reason why hardly any Lovecraft material has made it to celluloid is because it doesn't adapt well for the screen. Consequently, this is average stuff. Witches have been done to death (literally) in the movies and there's not enough of a slant to make the audience think they're watching anything new. Nevertheless, there are a couple of enjoyable scenes. When Walter ravishes what he thinks is the naked Francis, she suddenly changes into an old hag - one of the guises of the witch (no Friday night / Saturday morning jokes please!). After a particularly vivid dream in the house Walter wakes to find himself at the university, seated in his underwear and inexplicably reading The Necronomicon, the ancient Book of the Dead which is written in blood and bound in human skin. Of course, The Necronomicon was invented and heavily used by Lovecraft in his stories. Since then countless films and books have used the premise; most notably The Evil Dead and the Necronomicon series of books by Brian Lumley. The less said about the rat the better. The BBC were doing this sort of make-up for Sunday afternoon children's serials years ago. 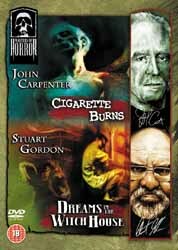 The Special Features are identical to the Cigarette Burns disc (just replace Carpenter with Gordon), and there is an interview with Chelah Horsdal who plays Francis. Again, the packaging from Anchor Bay is near exemplary, choosing to separate the two short films, as they deserve, and then placing them in a box sleeve. The only niggle is that the artwork of Carpenter on the cover looks like someone has sketched a corpse and then turned it to stone. This is some of the best horror stuff to have been made in recent years, and the trailers promise more gems to come. Roll on the next release in the series.